While the Russia probe is expanding to include naïve 36-year old Harvard graduates, pundits all over the world have been worried about elections in other countries. The massive WikiLeaks dump (pun intended) on Emmanuel Macron’s campaign in France did not work, so the next troublesome case seems to be Germany (the UK is fine, they are already leaving the EU). So, do you need to be worried about Germany? The short answer is no and here is why. Sueddeutsche Zeitung did the heavy lifting for me and published a study on ‘Facebook effect’ in Germany. They analyzed a million Likes of 5000 Facebook users on seven pages of the parties that have a reasonable chance of getting into the German parliament: Left party (Linkspartei), Greens (Grüne), Social Democrats (SPD), Free Democrats (FDP), Christian Democratic Union (CDU), Christian Social Union (CSU), and Alternative for Germany (AfD). The latter one is the party that was vocally supporting Trump’s presidential bid, so you can guess what they stand for. 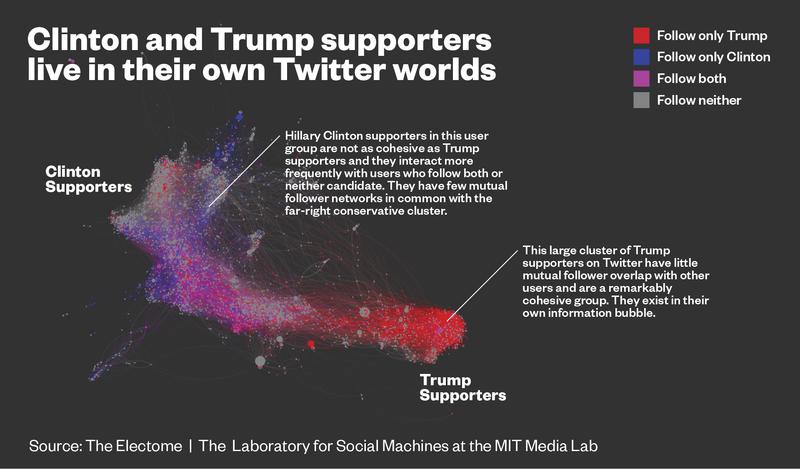 Sueddeutsche illustrated the Facebook effect with animated visualizations that show that six out of seven parties form a pretty mainstream communal bubble, while AfD (blue) is the only isolated echo-chamber that also uses specific news sources and references certain politicians. The only connection that AfD voters have with the rest of the political landscape is through CSU that gave birth to AfD in the first place. One of the main issues behind #45’s victory was polarization. Germany, however, is a different story. Even if trolls and fake news try to get into the German election debate on Facebook, this contamination will most likely be contained to the AfD echo chamber. On top of it, only about 22% of Germans use social media as their source of information and 92% get their news from TV. While this number may sound worrisome for an authoritarian regime, main TV channels in Germany are publicly funded and are not afraid to poke fun at Angela Merkel and other politicians. Emancipation through Song: What Can We Learn from Rock Music?